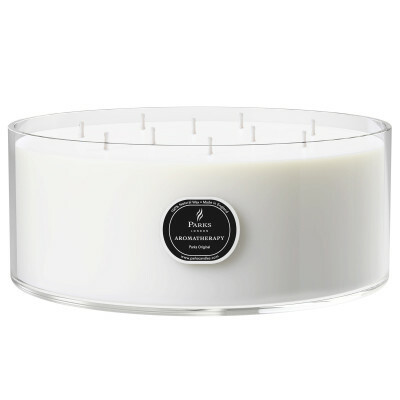 This stunning 10-wick candle is scented with our superb original fragrance, featuring fresh, uplifting lime and citrus notes, combined with lavender, bergamot and vanilla with soft woody undertones. 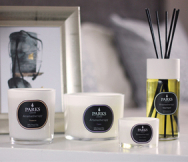 The lingering aroma is both sophisticated and stimulating, ideal for discerning individuals who like to make a style statement in their home. Presented in a sleek container with a silver edge and simple, stylish plain glass, this candle fits beautifully with both traditional and contemporary décor, providing a focal point for any room. A wonderful gift for a loved one or a luxurious and well-deserved treat for yourself, our 10-wick original fragranced candle incorporates a generous 2,700 grams of our pure, natural wax, giving you around 100 hours of heavenly relaxation. Put your feet up, open a bottle of wine and let your troubles melt away as this delicious aroma calms, restores and refreshes, lifting your mood and creating a peaceful ambience that you’ll want to return to, time and time again. Our candles are manufactured from our own wax blend using only sustainable ingredients from well-established farms. We use our own lead-free soot-free wicks and we fragrance each candle intensely with only pure essential oils, with no unpleasant chemicals that could damage your health or the environment. The exquisite scent is pure and natural, protecting and benefiting your family’s health while helping to create precious memories. Measuring 10cm in height and 25cm in diameter, this amazing candle comes in an absolutely beautiful sleek white presentation box, making it the ultimate gift for when you want to make a huge impression.